Peaking at 800 feet above the surrounding countryside and resisting the forces of erosion throughout vast periods of time, Crowders Mountain and Kings Pinnacle are remnants of an ancient mountain range. Once the core of mountains that rose thousands of feet above sea level, these surviving peaks are part of the Appalachian chain that formed in the region 450 to 500 million years ago. Geologically classified as kyanite-quartzite monadnocks, only the strength of quartzite has allowed these pinnacles to withstand the wind, water and other forces that eroded less resistant peaks. Crowders Mountain, at an elevation of 1,625 feet, is a registered natural heritage area that features sheer vertical cliffs ranging from 100 to 150 feet in height. 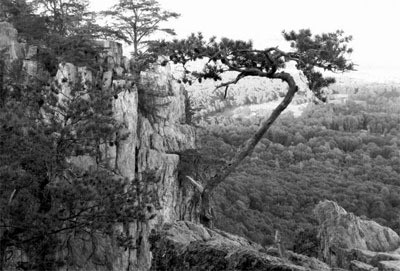 Kings Pinnacle, by contrast, has a round, gentle profile and reaches an elevation of 1,705 feet. These mountains and the saddle that connects them are oriented in a northeast to southwest direction, their slopes facing east and west. Prior to the arrival of European settlers, much of the land in the area was natural prairie that was grazed by herds of buffalo. The peaks marked the boundary between the hunting lands of the Catawba and Cherokee Indians, and a major trading route of the Cherokee crossed Crowders Mountain. During the American Revolution, the "over-mountain men" won a major victory for the colonists at nearby Kings Mountain. This small volunteer army was composed of hunters, farmers and herdsmen from the fertile valleys west of the Alleghanies. Their conquest of British loyalists at Kings Mountain marked the first step of defeat that led to Cornwallis' surrender and the end of a long and bitter war. The discovery of valuable minerals had considerable impact on the area. In 1799, a 17-pound gold nugget was discovered, and another weighing 28 pounds was discovered in 1803. Soon after, significant quantities of the treasured mineral were uncovered near Crowders Mountain. And, until the discovery of gold in California in 1849, North Carolina was the chief gold-producing state in the nation. Hundreds of mines scarred at least 10 counties during this North Carolina gold rush. Kyanite was also mined, and open-pit mining took place near Crowders Mountain, producing a devastating effect on the environment. In 2000, an additional 2,000-acre segment of land was added to Crowders Mountain State Park. Funded by the North Carolina Natural Heritage Trust Fund and the North Carolina Parks and Recreation Trust Fund, this land connects the state park to Kings Mountain National Military Park and Kings Mountain State Park in South Carolina. North Carolina Division of Parks and Recreation. Crowders Mountain State Park. http://www.ncparks.gov/Visit/parks/crmo/sights.php (accessed September 3, 2015). Wright, Angela. [View from Crowders Mountain]. Photograph. 2015. N.C. Division of Parks and Recreation Photos. http://www.dpr.ncparks.gov/photos/forPublic.php?pid=32931 (accessed September 2, 2015). 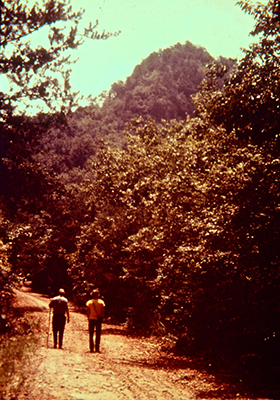 [Hikers on trail, Crowders Mountain State Park.] Photograph. ca. 1975. North Carolina State Parks.